TOURS OPERATE ALL YEAR ROUND. Concession fare applies to Australian or International Senior Card or Pension Card holders, Student Card and YHA Card holders. Presentation of card as proof of eligibility may be required. See our full review of this tour here. Older children are welcome on our tours. The child price applies to children 15 and younger. Children under the age of 8 will struggle with the level of hiking involved so it is not encouraged to bring children much younger than 8. We pick up from all Hotels, backpackers and private addresses in Hobart area. Alternatively the main pick up point is out the front of the Tasmania Travel and Information Centre at 20 Davey Street at 7.30am. Airport pick ups or drop offs are available - pick up time is 8am and drop off at 630pm. Please note these times are approximate only as there may be unexpected delays on the day. There is space on the bus for hand luggage to be stored during the tour, however large suitcases generally cannot be stored. Wineglass Bay is regularly voted as one of the best beaches in the world, and you will see why! It is located in the beautiful Freycinet National Park. The tour departs Hobart passing through quaint seaside towns as we follow the "Great Eastern Drive" route. We have numerous stops before we reach our lunch stop at Coles Bay. You can either buy your lunch at Freycinet Bakery Café or if fresh seafood is more your taste we also stop at Freycinet Marine Farm where you can indulge! 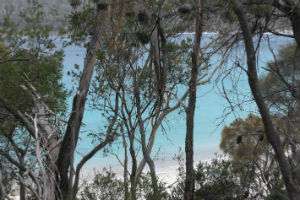 Now it is time to discover the beauty of Wineglass Bay! It involves a 45 minute (1.4km) walk uphill, it is not a race, so you can go at your own pace. The spectacular view is well worth the effort, you will be amazed at just how beautiful it is. And yes, it is just like the photos! It has a backdrop of the The Hazards, made from pink granite giving them a pink tinge. After taking way too many photos you will get to choose whether you take a 1.5 hour return walk down to Wineglass Beach where you have time to relax or go with your guide to explore other parts of Freycinet National Park. For those choosing to explore other parts, you will visit Cape Tourville & Honeymoon Bay. After almost 5 hours in the national park it is time to head back to Hobart with memories to last a lifetime!